Looking for a way to brighten up the flavor of your chicken dish? 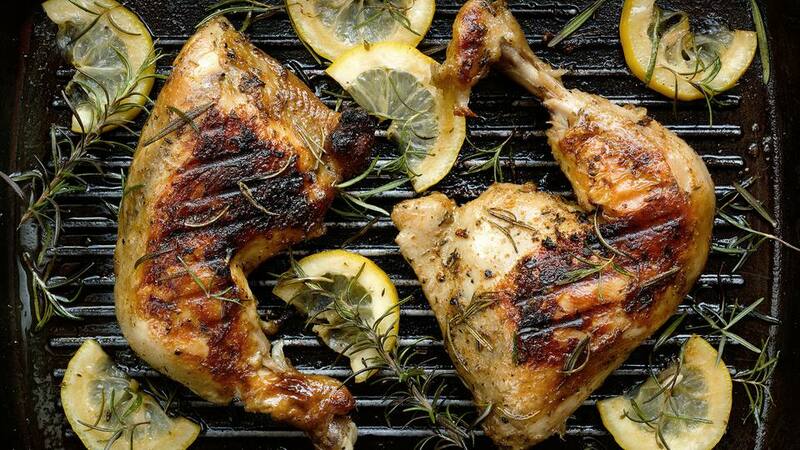 This lemon and rosemary marinade is a great solution! Not only does it work really well with chicken, but it tastes wonderful with pork too. Just add the ingredients to a medium-sized plastic bag or glass bowl, add your protein of choice, and then let marinate for about 1 to 2 hours. If you are doing meal prep, you can make this mixture ahead of time and store it in an airtight container in the refrigerator for up to a week, or in the freezer for up to 3 months. Which is great, especially if you have a busy schedule and need to add some vibrant flavors last minute. To make a complete meal, we recommend pairing your marinaded protein with grilled asparagus, sweet potato, and a fennel-avocado salad. Cut lemons in half and squeeze out the juice into a medium plastic or glass bowl. Add remaining ingredients and mix well. Marinate chicken or pork for 1 to 2 hours in the mixture. The mixture can be made ahead of time and stored in an airtight container in the refrigerator for 1 week and in the freezer for up to 3 months.